Addressed 1025 Powell St, San Francisco, Ca . They are titled as “Folksies” in the letter. Mom..I got your frantic letters about Honolulu..and it looks like theres nothing for you to worry about for awhile… as the deal we were trying to whip up for me to go half fare isnt panning out very fast. Anyway… Im probably not going to go at all now.. and if I do it wont be for several months. In the mean time…Im going to try to come home for a week or two. I have a Mother’s Day present, believe it or not… and in true Millie fashion havent mailed it yet… so its going out with this letter. Bill just got back from Honolulu.. and says things look very war like over there. We were going to go over… or rather I was going to go over to meet him there but he doesnt want to stay now as its practically a war base at this point. I hope you wont think Im crazy for not telling you this before… but it was a little hard to do because I havent told anyone…especially around Sears as it might affect my job,,, theyre getting quite stuffy about married people working. I married Bill before he went to Honolulu..and although I know you didnt like the idea so very much..I waited all this time to see if it would be the sensible thing to do. We knew each other for over a year..and I knew he was the only boy I could ever be happy with..everything carefully considered. I know you would agree with me if you knew him. I think he is up to all the standards we hold for ourselves. The only thing I feel badly about is not telling you at the time…but it is so hard to write these things and I was hoping I might be able to come home and tell you myself…. I am still working at Sears… and I definitely dont want Burr and the people there to know Im married…as I find its very hard for married women to get jobs any place these days. So for that reason…it might be good if you wouldnt tell Helen and George. Then they can come to Frisco..I can explain to them the situation and they wont say anything…but until then, I dont think Ill let them know. Dorry doesnt know either, but Ill write her right away. Bill is going to stay here now…and I think things will work out perfectly, at least until Roosevelt decides to send all our beautiful boys to war. Found this typed up 1938 Estate letter several years ago at an antique sale in Phoenix sitting on a table with various letters and papers. Order awarding all assets to surviving spouse and disch Administrator and bond. This matter came on regularly for hearing this 16th day of February, 1938, upon the petition of Calvin Richardson, surviving spouse and administrator of the estate of Ella M. Richardson, deceased, and it appearing that there are three minors of asaid deceased interested in the property of said estate, Mr. J.C. Bolinger, a member of the bar of Chelan County, Washington, being present and consenting to act, was appointed to guardian ad litem for this hearing for Wilma Richardson, 19 yrs old, a daughter, Calvin Wayne Richardson, 17 yrs old, and Glen Richardson, 10 yrs of age. Said petitioner appeared in person and by his attorney, Chas. R Sargent, and it appearing from the records and files herein that due and legal notice of this hearing has been given as required by law, the Court proceeded to the hearing of said petition. One witness was sworn and testified under oath, and documentary evidence was offered and received, and all and singular the law and the facts being hear seen, heard, considered and understood. It is Hereby Ordered, Adjudged, and Decreed, That Ella M. Richardson died intestate on or about Feb 2, 1936, leaving property described in the inventory and appraisment of file herein, of a total appraised value of $2028.91, including the dwelling house and land that goes with it, that the said petitioner has paid the expenses and cost of last illness and burial of deceased, and the costs of administration, that no homestead has ever been claimed or declared, and all of the assets of said estate, to wit, Household goods, 1 cow and calf, 1 team of horses, 1 set double harness, 1 1926 Dodge Coach, 1 1927 Model T, Ford Truck, 3 pigs, Miscellaneous small tools and implements, and $33.91 cash on deposit at First National Bank. Wasatchee, Washington, be and the same are hereby awarded and set aside to the said petitioner, Calvin Richardson, surviving spouse of said deceased, in lieu of homestead and also Tax #5, Sec. 10 and Lots 4 and 5, Sec. 11, all in Twp, 26 N. R. 21, E,W,M, be so awarded, and It is Hereby Further Ordered, Adjudged and Decreed, that inasmuch as there is no more property to be administered, the said Administrator Calvin Richardson, and his bond as said administrator, be and he and said bond are hereby released and discharged from all further liability in the matter. So Will possibly William Kirk looks to be the Boss, Supervisor? in a type of Machine Shop? I am not good at dating photos so if anyone can give a guestimation on a year for this photo chime in. All the workers are pretty young. My only course is to go through census records of each one and see if I can turn any of them up in the same area. Or a William Kirk census that says what he does for a living, which William Kirk is a totally common name, oodles of records pop up so without a location it makes it very difficult. So far I havent had any luck on this one digging around through census records. This was a tough picture to work with, as it did have clues, but not the best ones to work with. It has been sitting for almost a year in my tub of old albums. Its a large portrait. I found it in an Antique Shop in Phoenix, Az. It was hiding in a back room with some sale items. The shop has since closed and the building remodeled. Just after I typed this out. I tried searching on family search just using the first name Louise in Nevada, with a father named Leon. And right away I pulled up a list of names!!!!!!! Matching several of the kids, Wow, what are the odds without any last names?? The real giveaway to me was a daughter named Vevah in the family, its always nice to work with less common names to help narrow things down. 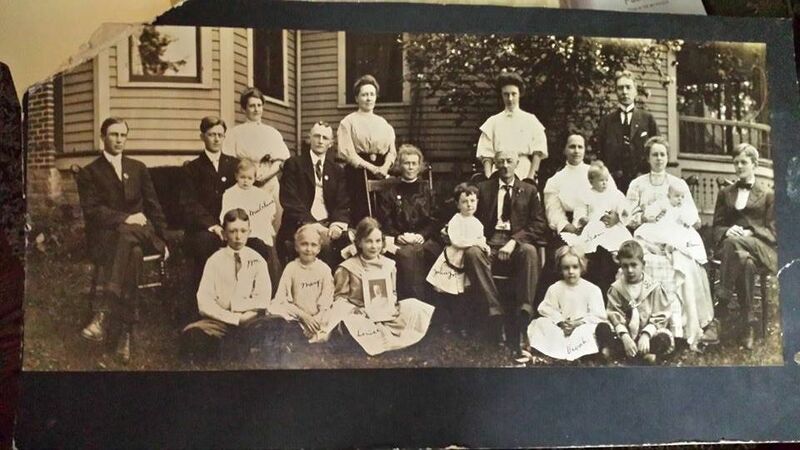 There is writing of first names of the kids on the front of the photo. The names that match with Leon are Louise, Vevah and Gilbert in the 1910 Census in Reno Ward, Nevada! As far as the group picture goes. There are no markings on the adults. Just the children. The names are as follows from Left to R. Starting with the little one in the mans lap. As I dig further, I find…..
Ernestine is daughter of James Ingersol and Allie Wyler. SHe married Charles L. Mears, who was a minister. Charles Leon Mears, 1924-1930: Mears was a graduate of Olivet College and Chicago Theological Seminary. He became minister to the La Crosse congregation in 1924. He was the first minister of this congregation to have his sermons broadcast on the radio. His preaching style was relaxed and conversational; he was more of a spiritual counselor than a moral arbiter. 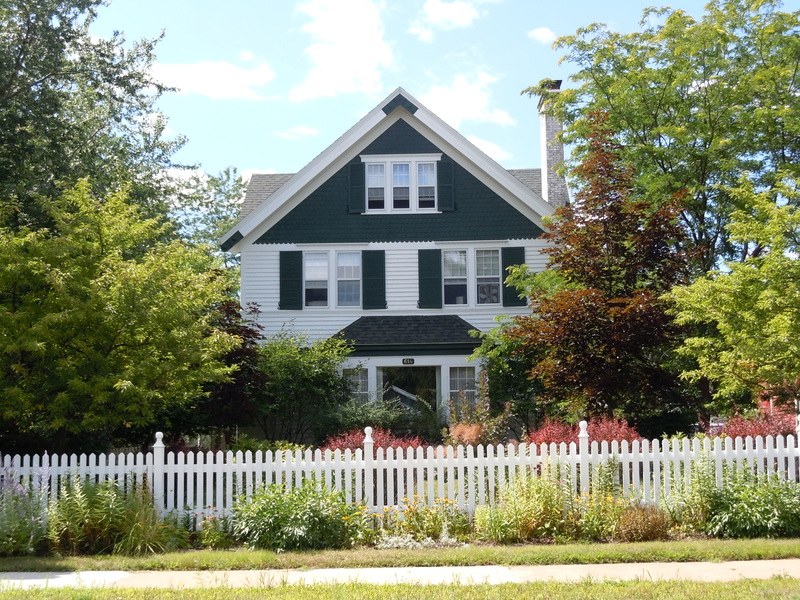 He and his family were the first to live in the Cass Street parsonage. He left La Crosse in 1930 to accept a call to California where he died in 1946. The American Library Association, founded in 1876 and chartered in 1879, is the largest professional organization for librarians in the United States. The headquarters of the American Library Association is in Chicago, Illinois. 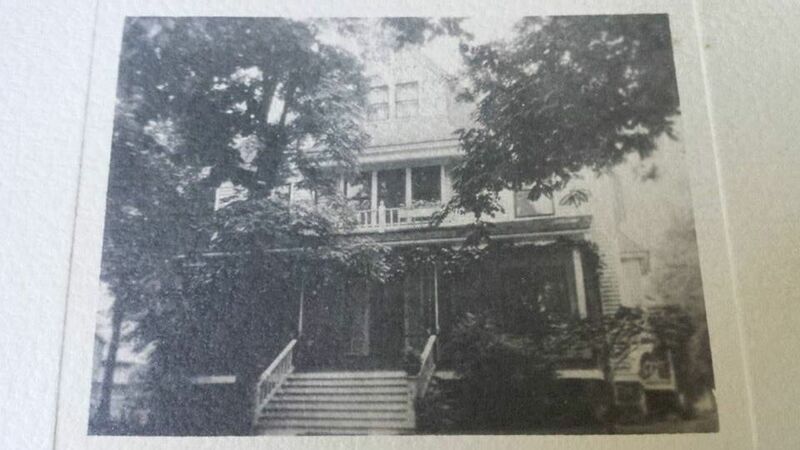 Now if we go back and look up Ernestines parents, their home is now a Historic Site…… So I am wondering if this is the very home in the picture that still stands today? Take a look at the photo on this link below, doesnt it resemble the seated man with the bald head in the family photo?) If you were to ask me Id say that is James. I have saved this blog for well over a year or 2, as I have been sidetracked by life but Im just now making it public, so Im now publishing this one. Im sure new info will turn up soon! Maybe from loved ones who come along and find my blog. 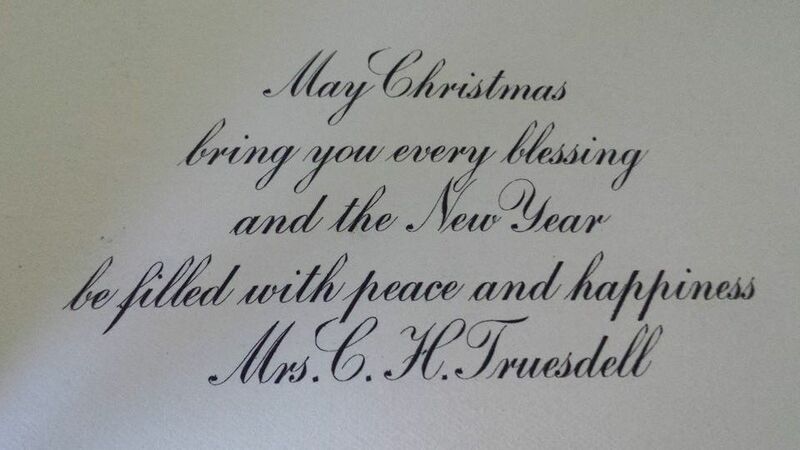 Mr. Truesdell died in 1917. Not sure how long his wife and kids remained in the home or if these cards were sent AFTER his passing. I love photos of old houses and love trying to see if I can find them still standing today. All I had was 2 photo cards with a name in them. 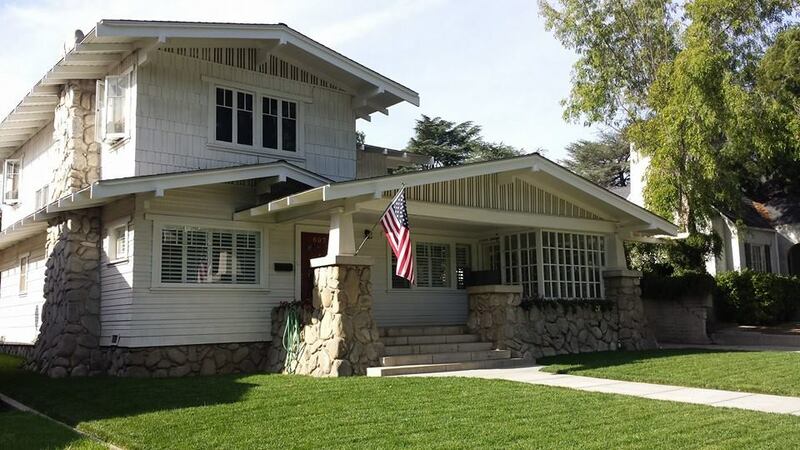 Well to my surprise this home has been beautifully preserved and and turns up on a website of historic preservation for the area! This info was found on the internet, website noted below. 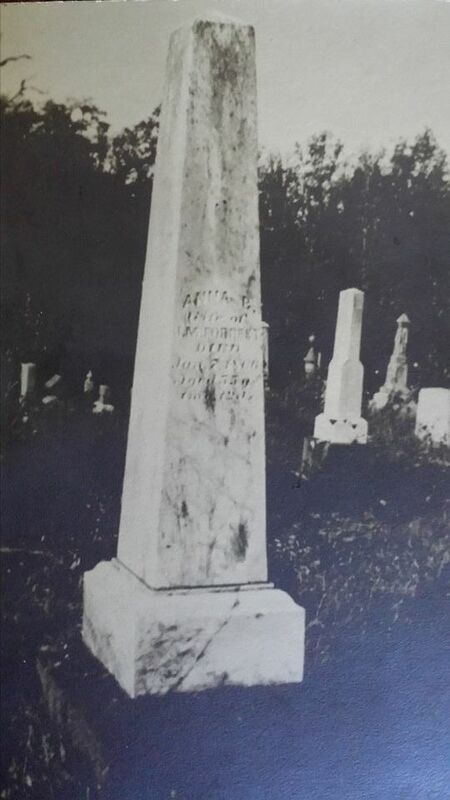 “Born Sept 19, 1863 Waupaca, Wisconsin Died 1964 OH. (Clarence Henry) Truesdell was born in Kenosha on September 30, 1866, where he received his early education in the public schools. He then attended Beloit College, and later the Chicago College of Pharmacy. On September 13, 1892, Clarence Henry Truesdell had been united in marriage to Miss Jennie Browne, the only daughter of the Honorable E. L. Browne, and they became the parents of three children: Mary, Edward B., who died in 1901 age four years, and Philip. For seven years Mr. Truesdell was the successful proprietor of a drug store in Chicago; this gave him the experience that he needed in compounding physician’s prescriptions. 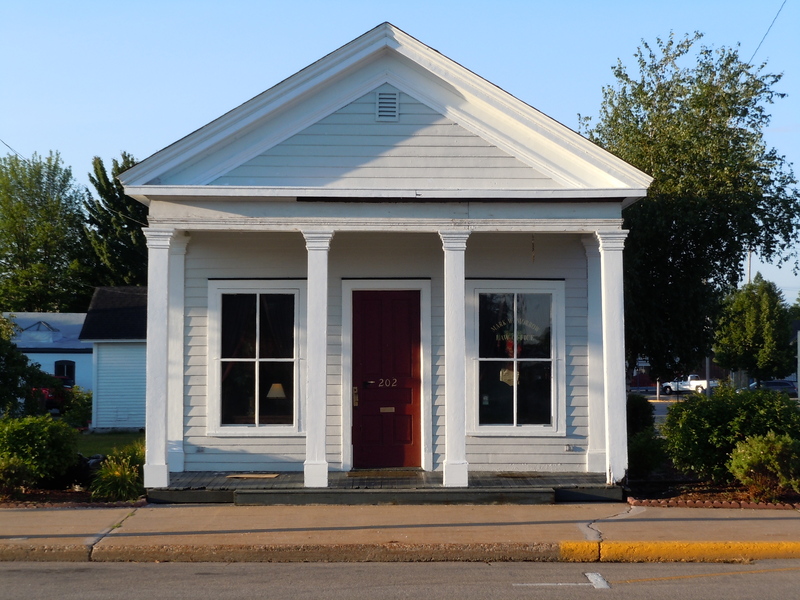 Truesdell came to Waupaca in 1894, and opened up a drug store in the north one-half of the newly-built Waupaca County National Bank building, that was located on the northwest corner of East Union and South Main Streets. This building is presently the headquarters of Coldwell Banker Petersen Realtors. It is here that Truesdell supposedly had the first soda fountain in Waupaca. Truesdell’s lease ran out on April 1, 1914, and was not going to be renewed because the bank had plans for expansion and needed the extra space. Truesdell moved his drug business to the Masonic Block, to the building that had just been vacated by the W. H. Laabs Grocery Store. 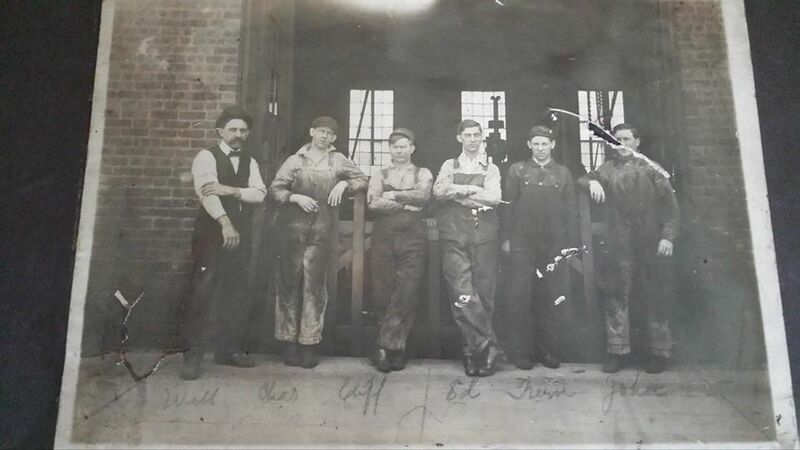 According to the Waupaca Record Leader, on May 13, 1914, Clarence H. Truesdell moved his drug business to 107 N. Main Street, the first door north of the Star Bakery. The Star Bakery, that operated at 105 N. Main for many years, is now (1993) the south one-half of the Stratton Drug Store. H. Truesdell remained at this location for just over a year, when illness forced him to retire. 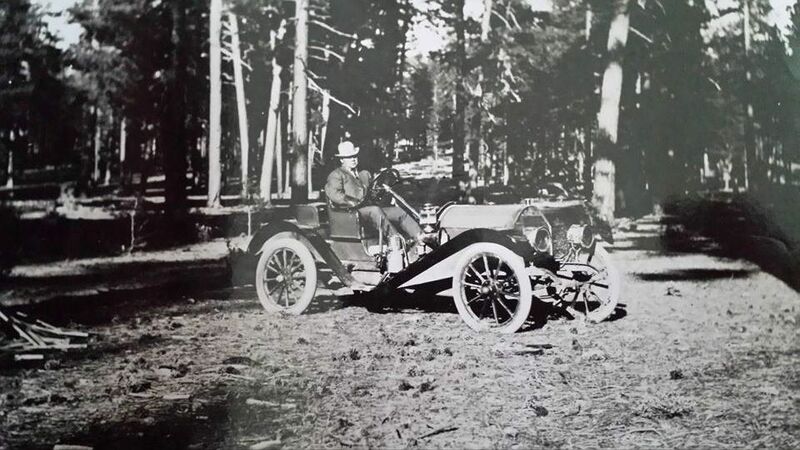 On September 1, 1915 he sold the business to Frank O. Stratton. Death cut short the young life of Clarence Henry Truesdell at his winter home at Biloxi, Miss., on March 24, 1917. Congressman E.E. Browne who brought the body also has a historic home preserved in the area. Statement of Significance: The C. H. (Clarence Henry) Truesdell home began construction in 1900 and was completed in 1901. 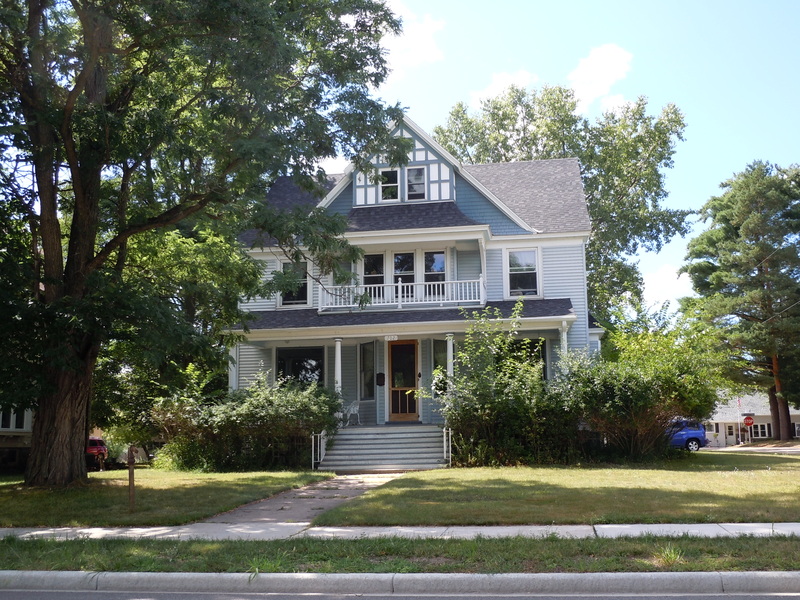 The home is one of the more prominent in Waupaca, closely reflecting the taming of the era in Queen Anne Architecture. Home styles were becoming more subdued by 1900. C. H. maintained a Pharmacy in Waupaca from 1894 until 1915. He and his wife Jennie (Browne) were prominent in the community. Jennie was the daughter of E.L. Browne. 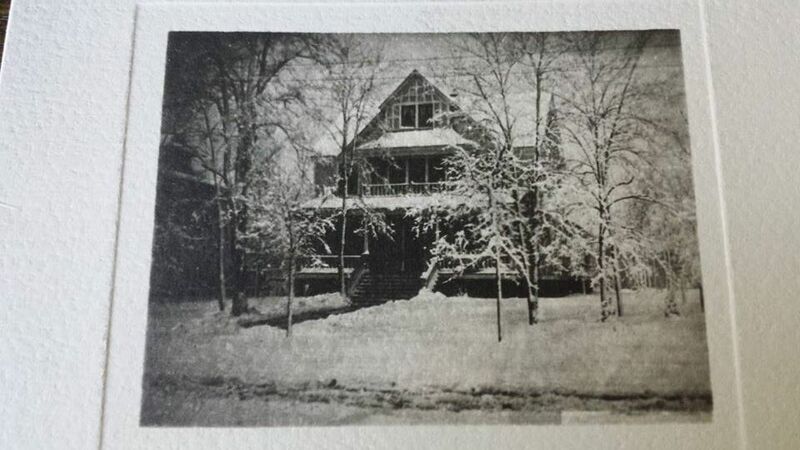 Winter Snow Photo of the Truesdell home on the second card I found. I hope you can keep all the notes and photos straight in this blog. When I start looking something up I sometimes end up going down other paths linking others together. Seeing as these cards came in such a large batch of photos of so many families you never know if more that lies in the photo collection contains the Truesdells or the Brownes. The following info is from the historic site descriptions of the Truesdell home. 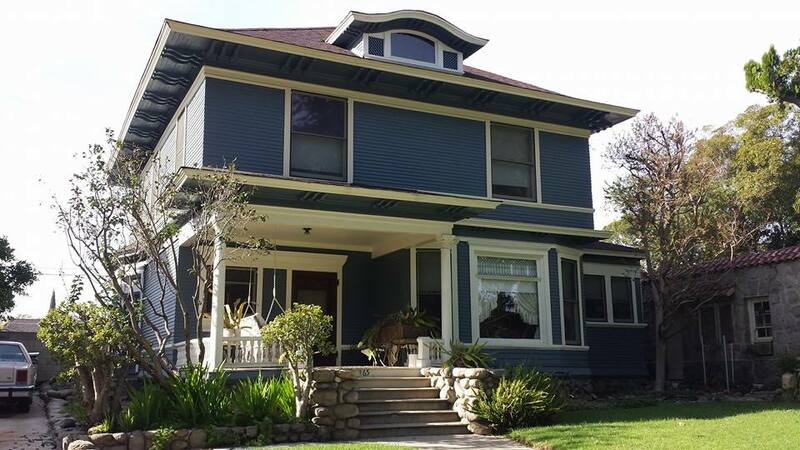 Exterior Description: The exterior of the C. H. Truesdell home “appears” original (wood construction) in physical appearance from the exterior. However, closer inspection shows that a majority of the house has been re-sided in vinyl. The scale of the siding is similar to that of the original clapboard, and does not detract from the home’s historic presence. Only the clapboard portions were covered. The gabled portions of the home maintain their original trim, as do the bargeboards and windows. The front (east) porch maintains its original appearance as well as the 2nd story east balconette. All window openings maintain their original sizes. Most of the home’s windows are original. The northwest room off of the kitchen could be original to the home. It is essentially built over the outside basement stairway. The footings are fieldstone; there may have also been an in-ground cistern here. This room may have originally been the “maid’s quarters.” Overall, the Truesdell home is in very original condition and appearance. The grounds also have a detached garage at the back (west) portion of the lot, which is not original to the home’s building era, the original carriage house probably sat in this same general location. Interior Description: The Truesdell home has maintained its original floor plan, except for changes made to the kitchen/pantry area. The front (east) entrance is accessed by an original large paneled white oak door with the upper half composed of glass. It is flanked by two side windows. The entry creates a vestibule area that “juts” outward onto the front porch. The foyer is lit by a chained globe, which appears original. The floor is a squared parquet design in, what is believed to be white oak. The floor has a thin (probably stained oak) border that follows the foyer’s floor plan. The stairway is a “half open” design; comprised of most likely white oak and original. The stacked paneled newel with rounded finial is also original and a common design in a late nineteenth (turn of the century) house. The staircase has an interesting small storage compartment below the main stair. The foyer doorway and window trim as well as the 10 inch mopboard are in white oak. The stair also has an unusual feature of a pocket door at the landing, which separates the foyer stair from the kitchen stair. Entry to the front (south) parlor is through double 5 panel pocket doors. The floor has a complex square parquet pattern of possibly white oak with a ribbon border around the perimeter in possibly cherry or maple. The parlor trim appears to be maple or, more likely, cherry. It does have a picture rail and coved ceiling. 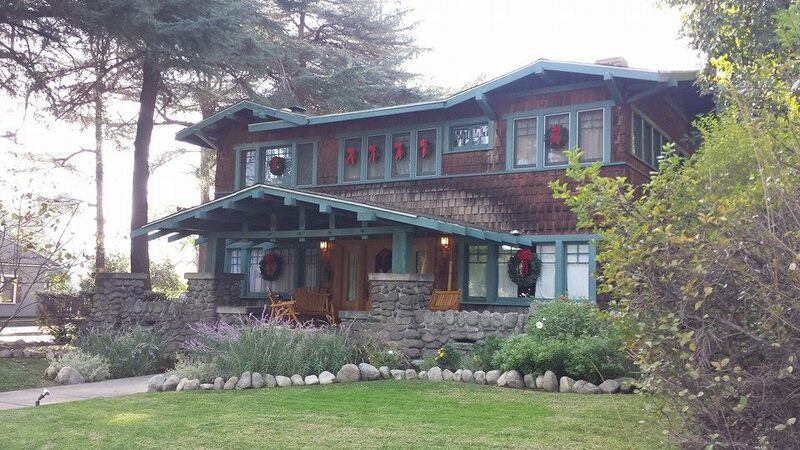 It has a large east facing “picture” window and south side standard double hung window. Door and window hardware is simple. The room is lit by a six light cast iron round fixture, which is most likely original. From the front parlor is access to the back parlor, which may have been a library or sitting room. These rooms are adjoined by 5 panel double pocket doors. The flooring is identical to the front parlor. Again, there is a picture rail and coved ceiling. The trim is also the same style and wood grain (likely cherry). The room is lit by the same style cast iron round 6 light fixture that adorns the front parlor. The room has a triple window bay style window seat and also a rear facing (west) standard double hung window. The room is dominated by an unusual fireplace mantle comprised of brick and terra cotta with fluted décor. It is flanked to the left (west) by a bookshelf, which appears original. Access to the kitchen can be from the back parlor or the short hallway from the foyer. This short hall also has the basement entry. The kitchen is in the northwest corner of the home. It has been modernized and changed but has a “period” feel. It does have the original pine floor. The kitchen also has access to the central stair. Off of the kitchen, near the dining room, was originally most likely a butler’s pantry, but has been converted into a bathroom. Connected to the kitchen is a back room, now used as a den. It appears to be original to the house or a very early addition. It may have been a maid’s room or served some utilitarian role as it has access also to the basement and a side porch entrance. The dining room is accessed by the foyer by a single 5 panel hinged oak door or by a 5 panel oak swinging door from the kitchen. The dining room has a diamond pattern white oak parquet floor bordered by a darker stained oak ribbon near the perimeter. It has a triple window seat (north) and a large front (east) facing “picture” window. Left of the kitchen entrance is an original china cabinet. All woodwork/trim is of white oak. The dining chandelier has triple shade lighting in a “japanned” finish. It is most likely original. The 2nd floor is comprised of 4 main bedrooms at each corner. The front (east) facing bedrooms are adjoined by a sitting room. All of the bedrooms have their own closets except for the front (northeast) bedroom, which now has a “master bath” which may have been converted from a closet(s). Between the rear facing bedrooms is a full bathroom, which still has its original pine/fur wainscoting. The bathroom has newer fixtures but a “period” feel. Flooring throughout the 2nd floor is 2 ¼-inch maple. Trim/woodwork appears to be of the pine family, possibly fir. Doors are 5 panel. Mopboards are 10 inch. All original to the home. The upstairs newel is also a stacked paneled design with a rounded finial as in the foyer. The stairwell also has its original handrail. Ceiling height is 8’6” on the second floor and 9’6” on the first floor. The basement is a “full”, with a stone/cement foundation and a concrete floor. This info can be found at…. Found these photos on ebay out of Oregon. They also were in the same batch as the Whitehead photo blog, not sure that there is any relation between those and these photos but I make notes just in case. 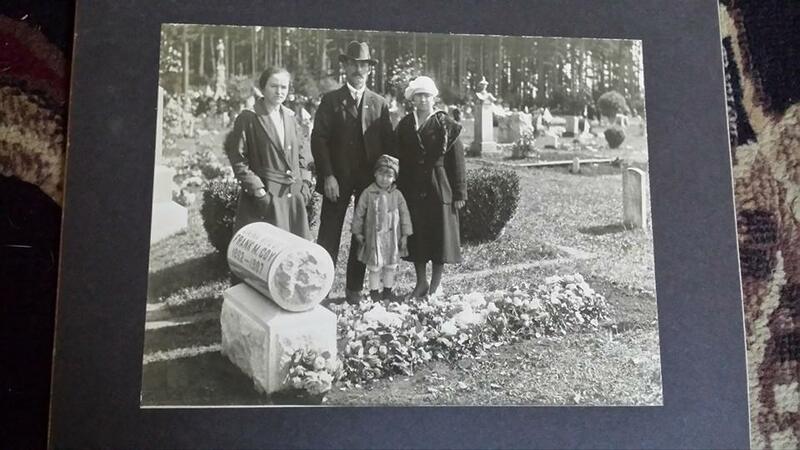 Photo is at Woodburn Cemetery in Marion County, Oregon. (click on the images to enlarge) It is the grave covered in a large amount of flowers for Frank’s wife EMMA. Born in 1862 and died in 1907. She was 45 yrs old at her death. Im wondering if this was her funeral? Or just visiting the grave. It is a beautiful photo. Frank is the man in the photo, I believe his daughter Mabel Loretta Coy Bowles is on the left side. (following the order names are written on back). Edna Nelson on the other side is his other daughter. On findagrave it says that Frank Coy passed away at the home of his daughter Edna’s home in 1948. 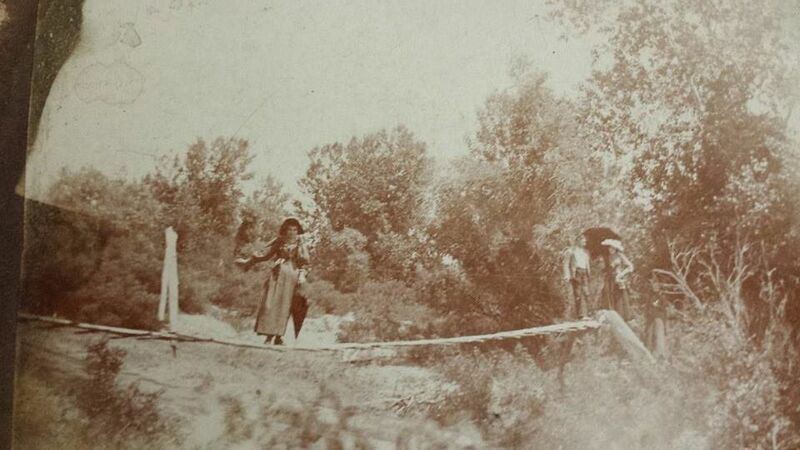 Willard Bowles is the little boy and is the son of Mabel. Born in 1915 and died in 2001. John Milton Forrest – Born 1808 Died 1865. Anna Bell Rhea Forrest Born 1810 Died 1866. 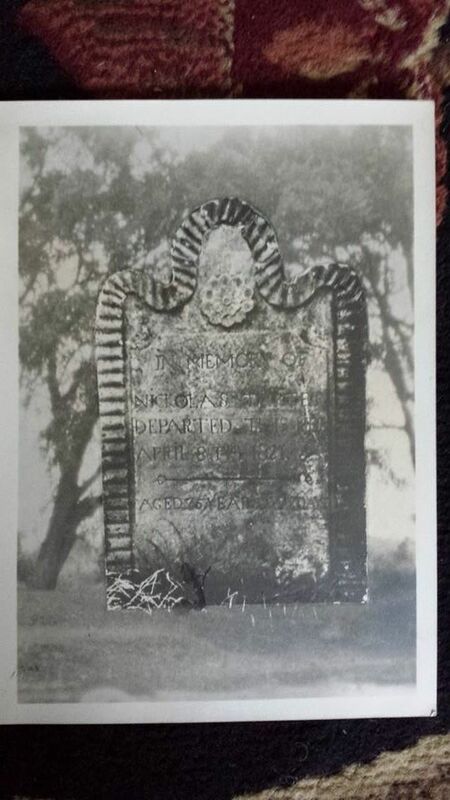 You can see their photo on Findagrave at his link, it also says they led a wagon train crossed the Oregon Trail . You can actually find the will written by Nicholas Darter which is fascinating. Then there is a detailed list of his possessions and their values. More of this will can be found here…. 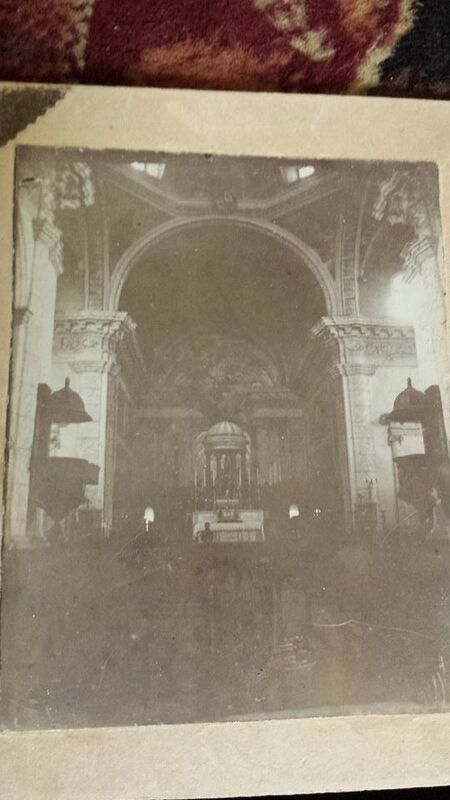 These 4 other photos also came in this batch, not sure if there is any relation and there are no markings on them. (February 2, 1803 – April 6, 1862) served as a general in three different armies: the Texian (i.e., Republic of Texas) Army, the United States Army, and the Confederate States Army. He saw extensive combat during his military career, fighting actions in the Texas War of Independence, the Mexican-American War, the Utah War, and the American Civil War. Considered by Confederate President Jefferson Davis to be the finest general officer in the Confederacy before the emergence of Robert E. Lee, he was killed early in the Civil War at the Battle of Shiloh. 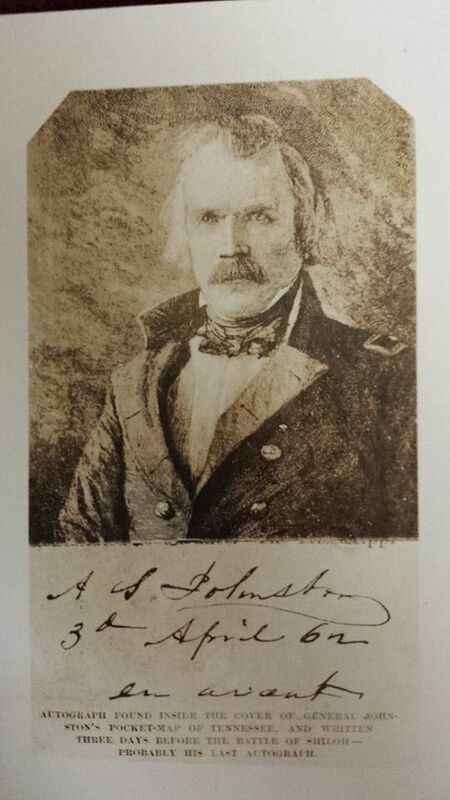 Johnston was the highest-ranking officer, Union or Confederate, killed during the entire war. Davis believed the loss of Johnston “was the turning point of our fate”. Monument to Johnston at Shiloh National Military Park. Johnston launched a massive surprise attack with his concentrated forces against Grant at the Battle of Shiloh on April 6, 1862. As the Confederate forces overran the Union camps, Johnston seemed to be everywhere, personally leading and rallying troops up and down the line on his horse. At about 2:30 p.m., while leading one of those charges against a Union camp near the “Peach Orchard”, he was wounded, taking a bullet behind his right knee. He apparently did not think the wound was serious at the time, or even possibly did not feel it, and so he sent his personal physician away to attend to some wounded captured Union soldiers instead. It is possible that Johnston’s duel in 1837 had caused nerve damage or numbness to his right leg and that he did not feel the wound to his leg as a result. The bullet had in fact clipped a part of his popliteal artery and his boot was filling up with blood. Within a few minutes, Johnston was observed by his staff to be nearly fainting. Among his staff was Isham G. Harris, the Governor of Tennessee, who had ceased to make any real effort to function as governor after learning that Abraham Lincoln had appointed Andrew Johnson as military governor of Tennessee. Seeing Johnston slumping in his saddle and his face turning deathly pale, Harris asked: “General, are you wounded?” Johnston glanced down at his leg wound, then faced Harris and replied in a weak voice his last words: “Yes… and I fear seriously.” Harris and other staff officers removed Johnston from his horse and carried him to a small ravine near the “Hornets Nest” and desperately tried to aid the general by trying to make a tourniquet for his leg wound, but little could be done by this point since he had already lost so much blood. He soon lost consciousness and bled to death a few minutes later. It is believed that Johnston may have lived for as long as one hour after receiving his fatal wound. Harris and the other officers wrapped General Johnston’s body in a blanket so as not to damage the troops’ morale with the sight of the dead general. Johnston and his wounded horse, named Fire Eater, were taken to his field headquarters on the Corinth road, where his body remained in his tent until the Confederate Army withdrew to Corinth the next day, April 7, 1862. From there, his body was taken to the home of Colonel William Inge, which had been his headquarters in Corinth. It was covered in the Confederate flag and lay in state for several hours. It is probable that a Confederate soldier fired the fatal round. No Union soldiers were observed to have ever gotten behind Johnston during the fatal charge, while it is known that many Confederates were firing at the Union lines while Johnston charged well in advance of his soldiers. Johnston was the highest-ranking casualty of the war on either side, and his death was a strong blow to the morale of the Confederacy. Jefferson Davis considered him the best general in the country; this was two months before the emergence of Robert E. Lee as the pre-eminent general of the Confederacy. This was a curious grouping of photos. Not sure if the seller just compiled them together or if they were in a group together. My sister lives in a historic downtown area in California just off the Euclid Exit. There are oodles of Huge Old homes in these neighborhoods. Euclid Ave is a beautiful drive. Not only are their huge old houses and huge trees lining this busy street, there are also huge medians in the center, they are like parks! 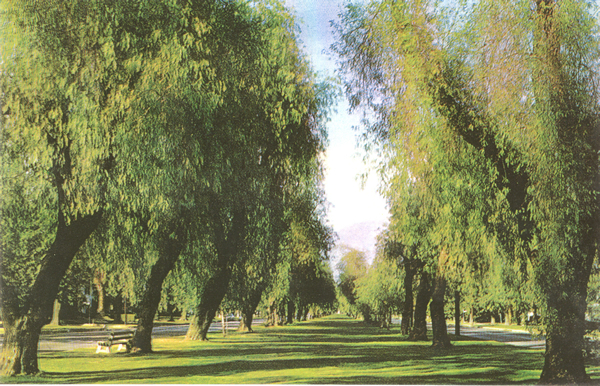 Grass and trees in the center of the road, its enough room for another 2-3 lanes in there. This photo is of Euclid Ave Circa 1930 but it looks the same today, just the trees are even bigger and fill the sky. 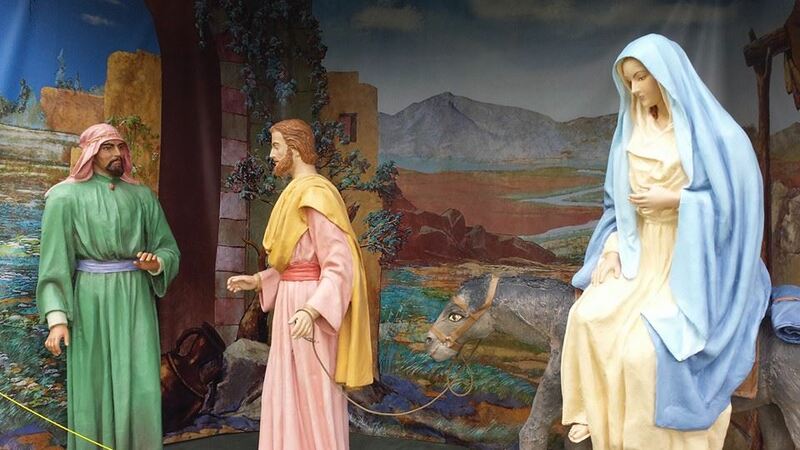 As you head down Euclid towards Holt where I go thrift shopping, you encounter after Thanksgiving these beautiful life size nativity scenes. I have seen them and always found them beautiful. And I also wondered how they came to be. With so many people trying to remove anything religious or showing Jesus from public areas. So this time I got my camera out and took some photos then went to Google to look up the story behind these displays. Its even more fascinating to hear! These scenes date to the 1950s, when the city held a carnival in its downtown area that featured rides and treats for the kids. 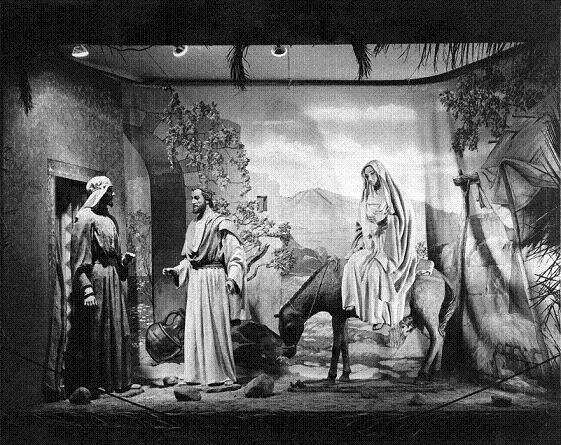 Found ONE photo of one of the nativity scenes when searching this out that was from 1967, would love to find more pictures of it back in its early days if anyone else can track any down. 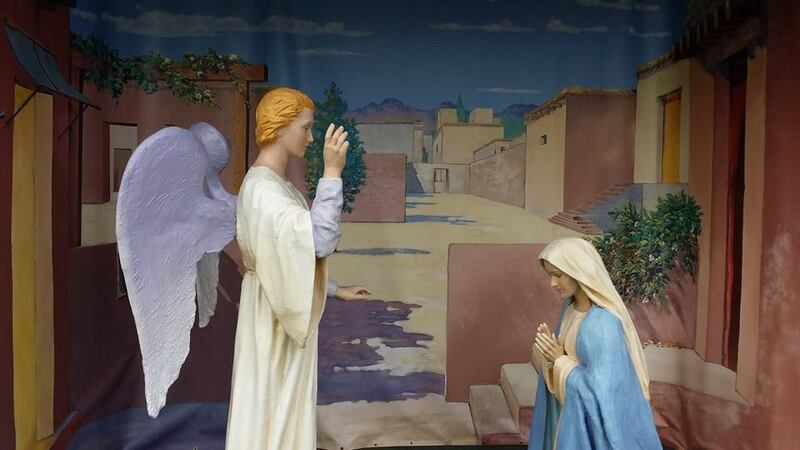 “It was a way for parents to keep their children occupied and watched over while they went and shopped in the stores for Christmas presents,” said David Allen who has researched the history of the Nativity scenes, says the event upset some local ministers. Rudolph Vargas an immigrant from Mexico in the 1920s, during an era of religious persecution in his native country, Vargas became first a furniture carver, then a mannequin maker, before being discovered by Walt Disney Imagineering, the theme-park designers. Disney used him extensively to model the plaster figures of history and fantasy displayed in the theme parks. 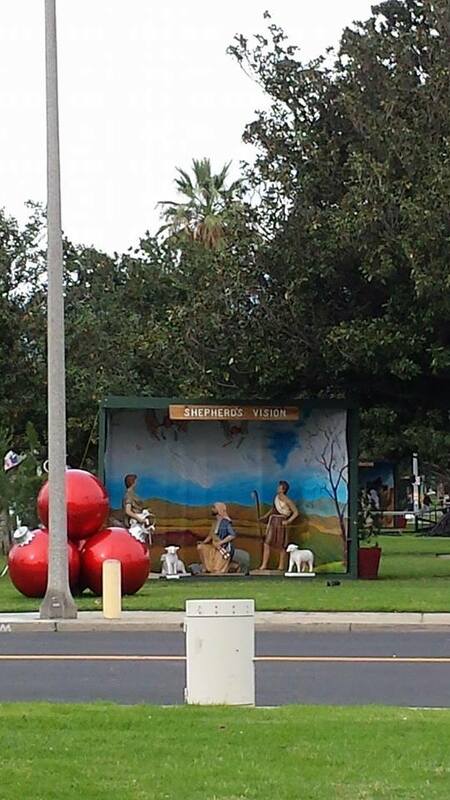 Originally sculpted by Vargas between 1959 and 1968, the Nativity statues are being restored and will be unveiled Nov. 22. 2014. Vargas, who worked on “Mary Poppins” and Disneyland’s It’s a Small World and Pirates of the Caribbean attractions, died in 1986 at age 82. Between the 1964 New York World’s Fair, for which Vargas created figures of President Abraham Lincoln and the characters of the “Small World” display, to the opening of the Epcot Center in Florida, Vargas was a regular Disney contributor. An unassuming man, bald, high-domed with a far-seeing look, Vargas earned his living doing what his family called “commercial” work. “He would work all day in his studio, doing the commercial things, then come home and work till 12 or 1 o’clock on religious figures,” said Vargas’ wife, Margaret. 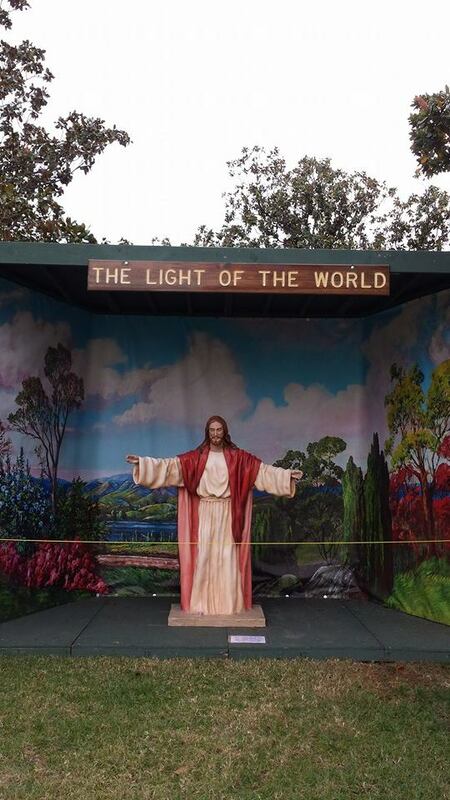 “The display is on public land and that has led to some controversy. 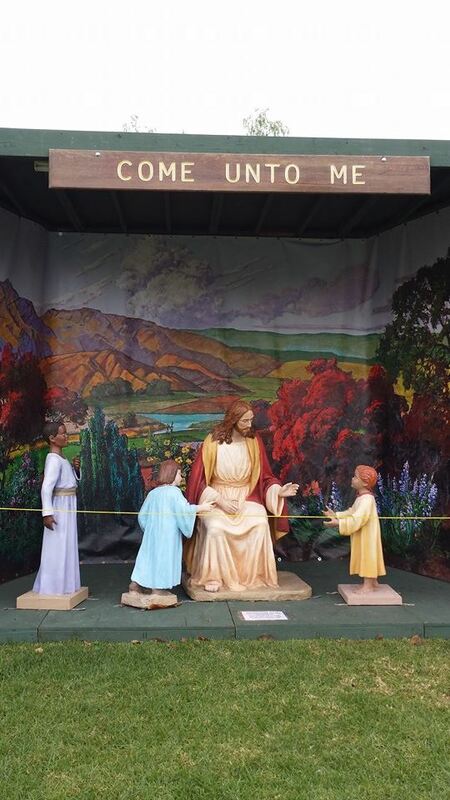 A local atheist filed a legal claim against the city in the 1990s after he saw public workers putting up the scenes. 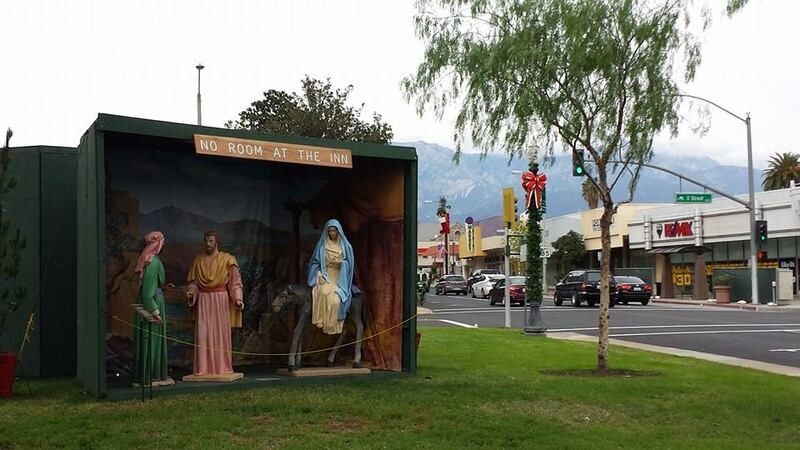 Montclair City Councilman Bill Ruh, who has been involved with the Nativity scenes for more than two decades, says Ontario and other public officials came up with a solution. I found this article about other work Vargas did in a Hospital in Duarte, Ca. The end of the articles says he left his autobiography with Mother Maria who was 85 at the time. I wonder what became of it? I hope it was saved and is in safe hands. “Vargas died at Santa Teresita in 1986 at the age of 82. He was commissioned to do the works at the hospital by Mother Margarita Maria, who founded the facility as a women’s tuberculosis sanitarium. The two met in 1932 after Mother Maria saw Vargas’ work at another church and contacted him. Both were natives of Mexico, according to hospital spokeswoman Michele Dulin, and the pair became fast friends until Vargas’ death. Mother Maria said she wanted classical art, “not something just semi-artistic” on the hospital grounds, to serve as therapy and inspiration for her patients, and the young Vargas was eager to oblige. 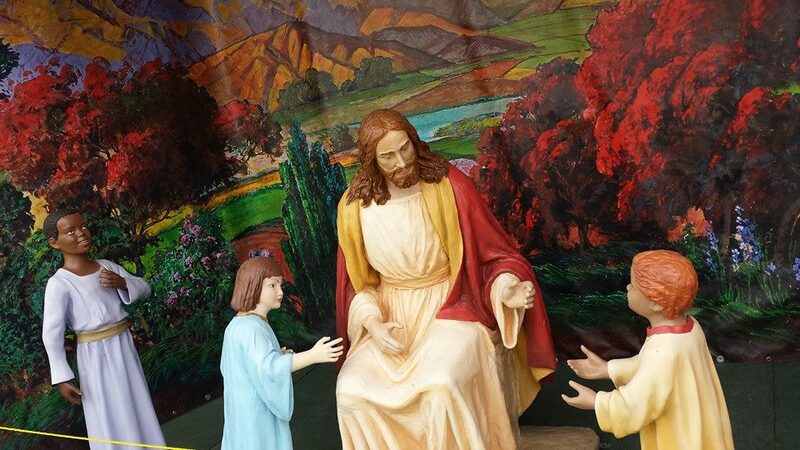 The sculptor worked on the religious pieces in between commercial assignments and viewed the carving he did for the hospital as “the one opportunity he had of leaving something behind where he felt it would be cared for and appreciated forever,” said his son, Rudolph Vargas Jr., an electrical engineer in Chatsworth. The artist more often than not was paid only for his materials. 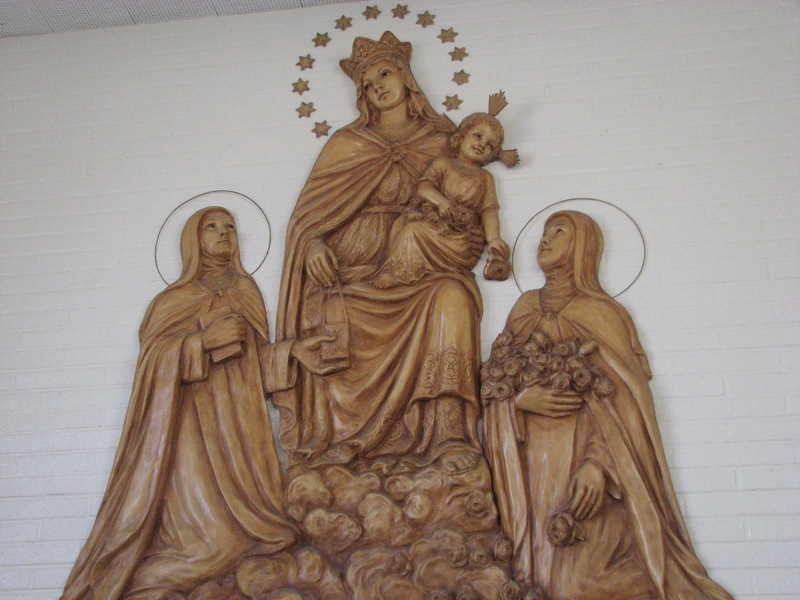 According to the pamphlet, Vargas’ relationship with the sisters “took off strong in the 1950s,” when Mother Maria commissioned him to create an 8-foot crucifix for the hospital’s chapel over objections from the architect, who wanted to order a piece from Europe. 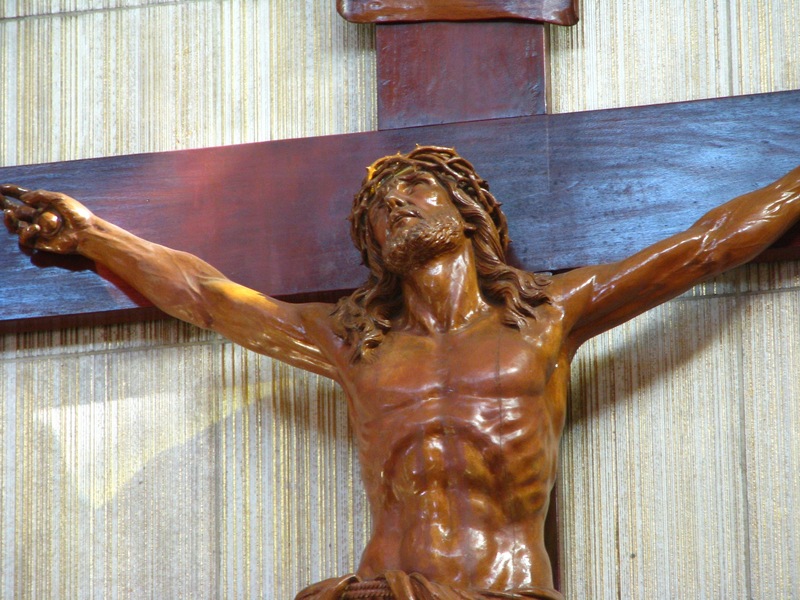 The riveting figure of Christ still hangs over the altar. It was Vargas’ greatest pride, said his son, and one of his best works. The 500-pound piece is said to be Vargas’ first major work in which the wood was left in its natural state, and took over a year to complete. A patio with a waterfall outside the hospital’s intensive care unit was designed by Vargas just before his death. “Here he was in the hospital, supposed to be sick, and he was up at 9 a.m. in the cellars” giving classes to the nuns on how to make ceramic molds, his son recalled. Im even more intrigued to hear about Rudolph Vargas the Artist, the person, what he wrote down in his autobiography and gave to the 85 yr old Maria in the 1980s. I also found it puzzling that I couldnt find much of his work when looking on the internet. Lots of mentions of it and locations, but very little photos. So I wonder if its in places where they dont allow photography? Or why there is very little when I go searching. I found some photos of his work at the Hospital! I was able to get out on foot in Ontario, park my van and walk up and get close to all of the scenes. It was moving and made me want to cry, I love history, I love the story of Jesus, I love seeing traditions stand the test of time and shifting culture. God Bless Ontario for keeping this up and for all of those who were involved in the restoration work to preserve all of these. Merry Christmas!